Laparoscopic adjustable gastric banding (LAGB) used to be a common procedure at the turn of the century and is still frequently encountered on CT scans in common clinical practice. Our aim is to present the frequency and spectrum of complication associated with LAGB, as observed in CT.
After approval of our institutional review board, a retrospective search for LAGB in CT interpretations using the term “band” between December 2011 and April 2017 was conducted. CT scans were reviewed to identify complications. The findings were divided into two groups: symptomatic, in which the complications caused acute symptoms for which CT scans were conducted, and incidental, in which complications were incidentally identified. The frequency of complications was calculated. We identified 160 patients who underwent LAGB and performed a CT scan. Complications were identified in 69/160 (43.1%) patients, with a total of 83 findings: 47/160 (29.4%) esophageal dilatation, 13/160 (8.2%) pulmonary complications, 6/160 (3.8%) abdominal abscesses, 5/160 (3.1%) small bowel obstructions, 4/160 (2.5%) intragastric band erosions, 4/160 (2.5%) tube disconnections, 3/160 (1.9%) port site and tube course infections, and 1/160 (0.6%) small pouch bezoars. When compared with patients’ referral notes, 38/83 (45.8%) of the findings were associated with acute symptoms, whereas 45/83 (54.2%) of the findings were incidental. Eighteen percent of the incidental complications were clinically important. Complications were found in 43% of CT scans of patients who underwent LAGB; less than half of the findings were symptomatic. Some of the incidentally identified complications had substantial clinical importance. This study is a retrospective study. Informed consent statement does not apply. Blackburn G. Effect of degree of weight loss on health benefits. Obes Res. 1995;(3 Suppl 2):211s–6s. http://www.ncbi.nlm.nih.gov/pubmed/8581779. Mendes-Castro A, Montenegro J, Cardoso JF, et al. 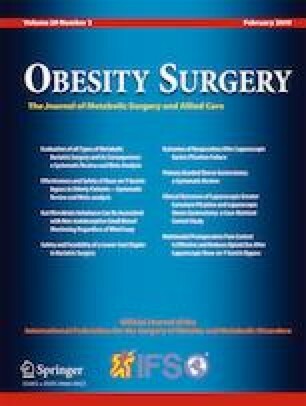 Laparoscopic adjustable gastric band: complications, removal and revision in a Portuguese highly differentiated obesity treatment center. Acta Medica Port. 28(6):735–40. http://www.ncbi.nlm.nih.gov/pubmed/26849758. Shen X, Zhang X, Bi J, et al. Long-term complications requiring reoperations after laparoscopic adjustable gastric banding: a systematic review. Surg Obes Relat Dis. 11(4):956–64. https://doi.org/10.1016/j.soard.2014.11.011.